The video has already garnered over 10 lakh views already. Touted to be the ‘real biopic’ of the former Andhra Pradesh Chief Minister, director Ram Gopal Varma dropped the trailer of his upcoming political flick, Lakshmi’s NTR. Expected to stir controversies, the upcoming movie mainly focuses on NT Rama Rao‘s controversial relationship with a woman called Lakshmi Parvathi, who initially started out to pen his biography but ends up marrying him to a lot of negative remarks. The 3 minutes 10 seconds long trailer shows Lakshmi Parvathi approaching NTR and the flow of incidents thereof while also traversing through NTR’s life, post his defeat in elections in 1989. The dark and intense trailer also highlights what followed after the defeat and hints that NTR was dethroned because of betrayal, as the lead actor says, “The only mistake I did in my entire life is to believe in that snake.” The trailer ending on this indirect jibe at Andhra Pradesh’s CM Dr N Chandrababu Naidu, might spark controversy. Taking to his Twitter handle, the filmmaker wrote, “Here is the trailer of the most intense and dramatic love story ever ..Wish u all a very happy Valentine’s day” (sic). The video has already garnered over 10 lakh views already. 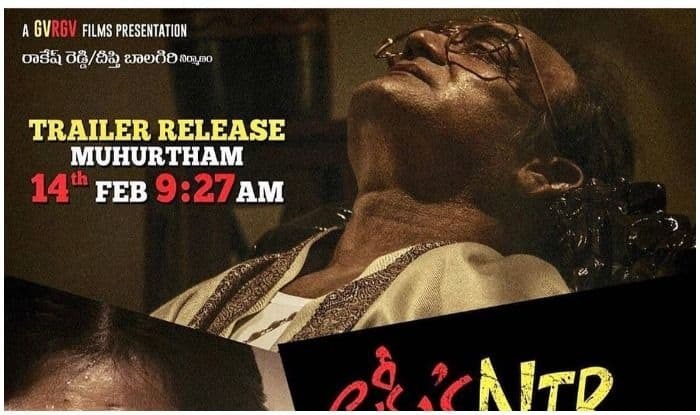 While Yagna Shetty plays the role of Lakshmi Parvati, Tharak Ponnappa plays Chandrababu Naidu and the full theatrical trailer off Lakshmi’s NTR will be released on February 22, 2019, alongside NTR Mahanayakudu, a sequel of NTR: Kathanayakudu. NTR: Kathanayakudu was panned by critics for not touching upon any of the negative side or controversy of NTR’s life and was accused of glorifying the former Chief Minister of Andhra Pradesh.